Authorities in Turkey searched Sunday for a gunman who opened fire at a packed nightclub during New Year's celebrations in Istanbul, killing at least 39 people and injuring 69. “Our security forces have started the necessary operations. God willing, he will be caught in a short period of time,” Soylu said. More than 500 people were inside the Reina club when the attack began about 1:15 a.m. local time. A closed-circuit television recording of the attack showed the assailant wearing a Santa Claus hat part of the time, according to the Associated Press, which obtained the recording from the Haberturk newspaper. The video shows the attacker dressed in black and carrying a backpack as he shoots a police officer outside the club. The attacker left a gun inside the club and escaped by “taking advantage of the chaos” that ensued, Yildrim said. No one has claimed responsibility for the attack, which Turkish authorities said was carried out by a lone assailant. 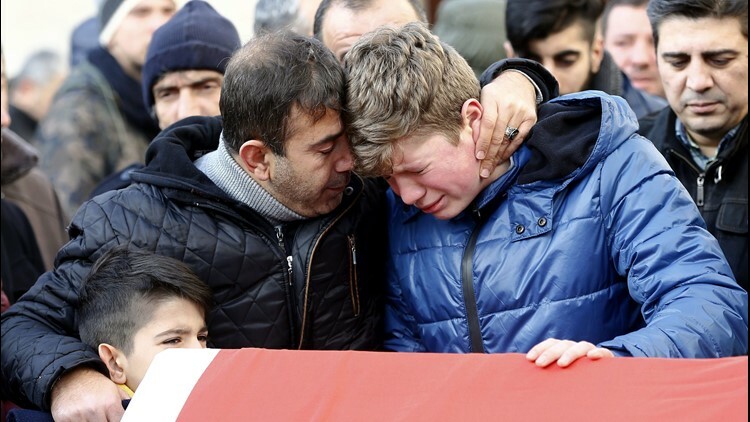 This is the fourth major attack in Turkey in the past month, including the Dec. 19 assassination of the Russian ambassador to Turkey during a photo exhibition in Ankara. Erdogan said his country is "extremely determined to do whatever it takes" after recent terror attacks to secure the region. Turkey is a member of NATO and a partner in the U.S.-led coalition against the Islamic State. The bloodiest attacks that Turkey endured in 2016 were the work of the Islamic State or Kurdish militants. Reina owner Mehmet Kocarslan told the private Dogan news agency that police had boosted security measures in the upscale neighborhood and its vicinity. The efforts included a 24-hour police presence and complementary efforts by the coast guard at sea. State-run Anadolu news agency reported Sunday that a police officer, Burak Yildiz, 22, was shot and killed outside the nightclub. A female security guard, Hatice Karcilar, 29, was also among those killed, according to Anadolu. At least 15 of the dead were foreign nationals, Soylu said. The White House condemned what it called a “horrific terrorist attack” and offered U.S. help to Turkey. "That such an atrocity could be perpetrated upon innocent revelers, many of whom were celebrating New Year's Eve, underscores the savagery of the attackers," the White House statement said. The U.S. consulate in Istanbul warned Americans there to limit their movement around Istanbul "to an absolute minimum" as extremist groups target where expatriates live or visit, such as restaurants or places of worship. "I ask the Lord to support all people of good will who courageously roll up their sleeves to face the plague of terrorism and the bloody stain that envelops the world with a shadow of fear and bewilderment," Francis said, in a departure from his prepared text. In Istanbul, Sinem Uyanik described the scene in the nightclub as she waited outside Sisli Etfal Hospital to see her husband who was wounded in the attack. Some patrons escaped and jumped into the Bosphorus Strait. "Unfortunately, (he) rained bullets in a very cruel and merciless way on innocent people who were there to celebrate New Year's and have fun," Istanbul Gov. Vasip Sahin told reporters.